Unfortunately it was a bit quiet for the last weeks. I have decided to modify my old blog features and (some of you'll have already noticed) my blog From Books Paradise became bilingual. For more information click HERE. 'Books in Paradise' will be a comprehensive post, where I write about the new books on my shelf (bought, received for review, gotten from library and so on), the books I enjoyed reading, the books I'm currently reading and the books I'm planning to read next. Furhtermore I would share the books I added om my wishlist. From now on 'Books in Paradise' will be posted every weekend (mostly on Sunday). This time I have to post about the last two weeks and I got seven new exciting books. I've bought four English books, one German one and I've received one German book for review. Special thanks go to Langenscheidt. And last but not least I've got one book from library. The last two weeks I've read five books and two of them were really good and belong to my favorites books this year. 'Das Geheimnis der Totenmagd' is an amazing German historical thriller that gave an informative message: Life is terrible but it's too precious / beautiful to give it up. Also I've read the German version of 'Learning to Swim' and it's a stunning debut from Ms. Henry - so excinting, I love it! The next week I'm planning to read four books. 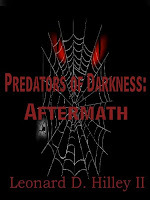 And I'm looking forward to start the Predators of Darkness Series by Leonard Hilley II. There are many books I added to my wishlist this week and on Thursday I've seen the US-Covers of the Guild Hunter Series and I felt in love with them - arghhh. That's why I'm going to buy the US version of the series - I can't help it.